Charlotte Storrs was born in Holland and studied languages at Utrecht University. After working as an interpreter and translator, she pursued her love of music and obtained a conservatory diploma for violin in The Hague. She came to Britain to study at the Guildhall School of Music. She studied ceramics in Chichester before her children were born, and later in Oxford with Graham Hudson. 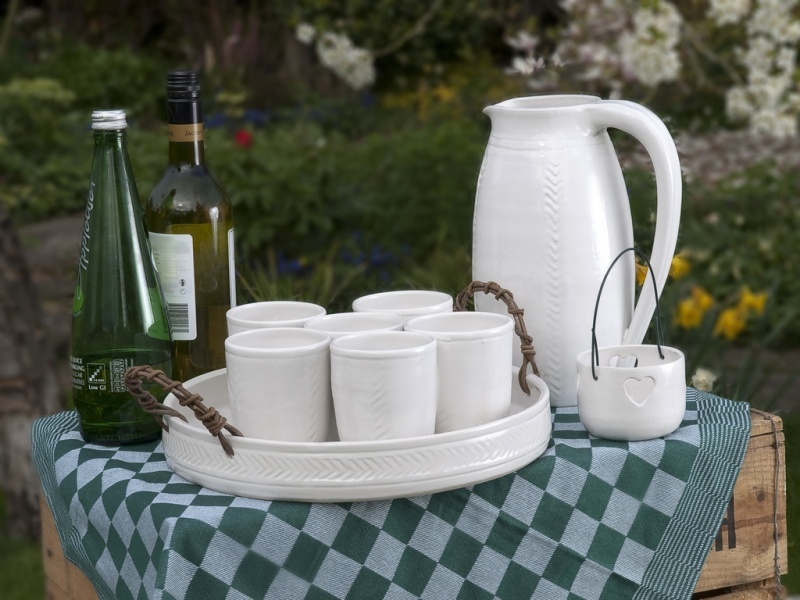 She works from a well equipped pottery in her garden in Culham and sells through shops, galleries and her website. In the UK she has sold through Liberty's, David Mellor, Daylesford. For current UK stockists see Outlets. She makes functional stoneware, pots and dishes which can be used on a daily basis. Pots are fired to 1250 degrees in an electric kiln using green electricity. She uses a white glaze made specially for her in Ireland. Decoration is limited to combing and using patterned ceramic rollers on the clay. Since visiting potters in Japan she likes to incorporate akebia vine in her work. Charlotte Storrs was on Elle Decoration's design Hot List 2011 of the New, the Classic and the Collectable. A 2-hour one-to-one throwing session at the wheel. Up to 5 pots glazed and fired. Cost including materials £75. By arrangement.